Probiocin is a probiotic supplement that helps maintain a healthy digestive system by supporting the proper bacterial balance in the lower intestine. For animal use only. Keep out of reach of children. In case of accidental overdose, contact a veterinarian immediately. Soybean Oil, Corn Starch, Sucrose, Silicon Dioxide, Dried Enterococcus Faecium Fermentation Product, Dried Lactobacillus Acidophilus Fermentation Product, Dried Lactobacillus Casei Fermentation Product, Dried Lactobacillus Plantarum Fermentation Product, Sodium Silico Aluminate, and Mixed Tocopherols. Post - Weaning: 1g per 10 lbs of body weight, following therapy or digestive upset. Repeat as needed. Store in a cool, dry area for maximum stability. 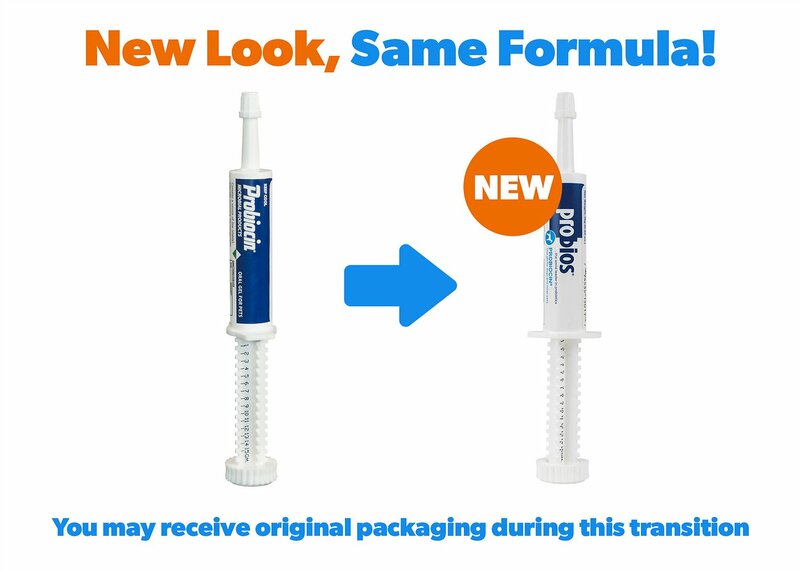 The product is fine but there's virtually nothing inside the syringe; that is, unless you only need the product for one cat. I needed it for six (6) cats and it was virtually gone in two days' use. Our kitten had super stinky fairly-loose stools since we got him, but after a round of antibiotics they went completely liquid. I gave him a dose of this every day till it ran out. Now his poops are healthy, solid little clumps. He loved the taste too. I had doubts that probiotics actually worked, but the results were startling enough for me to write my first online review ever. I was really happy to see that I could get this from Chewy and at quite a saveings. This is an excellent product. I have used probiocin for years on dogs and cats. We recently had a puppy on antibiotics so this was a must for her. Helped keep the diarrhea at bay. I highly recommend this product for everyday use. This item cost $25 at the vets office! I received this item within 5 days of order date. I am very happy with this purchase. Animals love the taste, so it's easy to give to pets. My cat has had tummy issues for years. I've had vets to recommend exploratory surgery. I always chose to go with probiotics but my furbaby wouldn't eat the food that had the medicine sprinkled on it. And she became wise to the pill pockets. But this stuff...she looks forward to her "treat". Its only been a week since being on it so I haven't seen huge changes. I will let you know. But she is voluntarily taking the "treat" which is something I would have had to force her to do before. Less stress for her and mom. When my dogs have stomach issues or take antibiotics, my vet always recommends this product. I can get it at Chewy.com for 1/2 the price! Win for my dogs and win for me! I use this with dogs and cats that are recovering from gut issues including the use of antibiotics. It seems to get them back on track quickly.